The new season is upon us. The HP Pro Tour has already announced their new schedule and I have been tasked with setting up the records for American Legion Post 7. During the past few months I have been busy testing, designing and producing prototypes for 2012. The GrabIt has been licensed for another year. I have received back from the foundry 8 different designs undergoing various phases of testing and have 3 more 3D printed and awaiting prototype casting at the foundry. A Stance Change — In Part 31, I described a rather unusual stance. It was a stance developed to permit me to look down the target line at release and totally eliminate arrival of the shoe on the right side of the stake. It served me well in 2011 with a 1st place win in the HP Pro Tour event in Frederick, Md., and other Maryland tournaments. However, it places a bit of pressure on the left hip and I want to offer an alternative that is a bit more traditional, but, still considers the role of the left shoulder at release. The following is a good second choice from either left or right side. Place the left foot back and right foot forward. Place more weight on the right foot. This will force the Line of Flight cord further right and will naturally require a shift rightward to the Visual Alignment Point. As mentioned, the Aviator has been approved by the NHPA for licensing for 2012. I would have to pay the $300 licensing fee for the 1st year. I want to describe the design features of the Aviator that are unique, relative to other produced horseshoes. The Aviator is designed to produce a shoe that weighs 2 pounds 8 ounces. The Aviator is roughly based on the shape of the Steinfeldt of old. The Aviator top and bottom shown below. Thumb Calk — has been designed to allow the first joint of the thumb to lock-in to the top edge of the calk and fit naturally to the depression behind the ringer break. This feature shown below. Hook Calk — The hook calks are quite unique. First, they are symmetrical, i.e., calk shape is the same on the top and bottom. Thus, it permits a shoe to be flipped or turned properly without the necessity to have a shoe created specifically for flipping and one for turning. 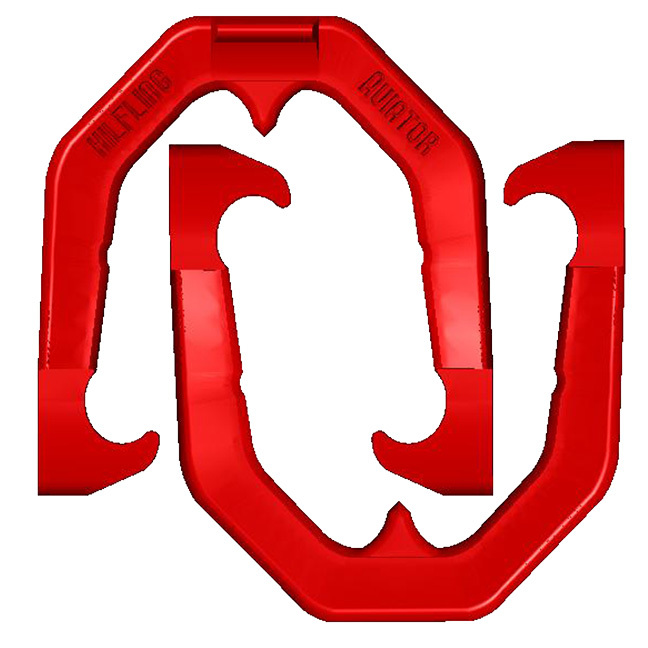 Most shoes designed for flipping have the thumb calk on one side and the skid plates of the hook calk on the other. For turning, thumb calk and skid plates are on the same side. See image below. The second unique feature is — the front end of the hook calk is blunted. This is specifically designed as a safety feature. Last spring, I was keeping score behind and to the right of the pit when a traditional shoe hit the top of the stake and ricocheted upward and the front point of the hook calk hit me in the chest. It broke the skin, left a huge bruise and I still have a knot on my chest from the impact. 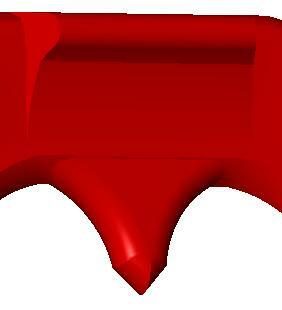 I decided to change the design of the hook calk to eliminate this sharp point. See image below. Shank Shape — The shape of the shank has been changed to add the shoe weight to the outer perimeter of the shank. It gently slopes inward to provide a more appropriate grip position for the thumb and fingers. See image below. 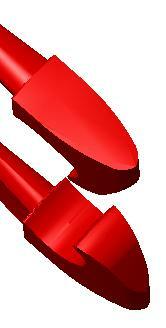 Shank Notch — The shank notch is provided to define the halfway point and center of gravity of the shoe. See image below. Ringer Break — The ringer break has been designed to deflect the shoe left or right and eliminate bounceback. 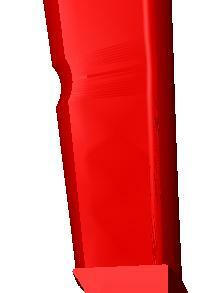 It is also designed to permit the reverse flippers a proper grip position. See image below. 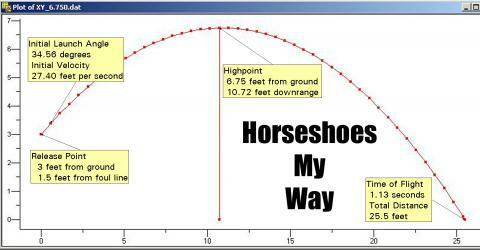 Here I’m introducing a new concept in turning the horseshoe. Most turners will rotate the shoe 3/4, 1-1/4 or 1-3/4 turns. The 3/4 flip-turn is also popular. 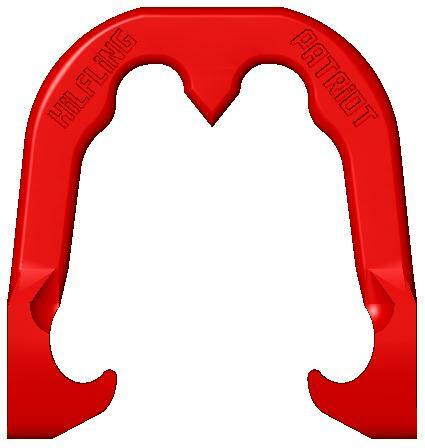 The Patriot is designed to turn 1/3 to 1/2 rotations. While experimenting with a variety of pitching grips for flips and turns, I used a 1/2 turn with Snyder EZ Flips for one tournament season. It worked pretty well, but, the sharp edge of the thumb calk and hook became problematic after an hour or so of pitching. So, I decided to design a shoe that allowed me to hold the shoe at the hook calk and turn the shoe 1/3 or 1/2 times. Here is the logic. If you turn a shoe, the side opposite your grip will generally be a little closer to the ground when released. If you were to grip the shoe at the thumb calk as an extension of the arm, when released the hook calks are closer to the ground than the thumb calk. If you were to release the shoe with 1 complete turn, it would arrive at the stake with the hook calks down. In order for the shoe to arrive flat you would have to add a little move to flatten the shoe when released. If you were to turn a shoe 1/2 rotation, the edge opposite the fingers would arrive exactly as released. For example, if I grip one of the hook calks, in most cases the thumb calk end would be lower than the hook calks at release. 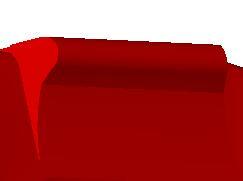 Therefore, the shoe would arrive with the thumb calk end lower, which is a good thing. If you flip a shoe, it is only flat 1/360th of a revolution. Sometimes, flat, sometimes under rotated and sometimes over rotated. The thumb calk has a notch for the placement of the thumb and the normally sharp inner point of the hook calk has been flattened and enlarged. Below is an image of the Patriot. The Patriot can be flipped or turned. I have designed the shoe to be tip heavy by 1/4″. If used as a flip shoe the oversized ringer break adds a platform to support the weight of the shoe with the index finger. The shoe can also be used as a traditional turn shoe.